Fix the Page Elements Layout Editor No Scrollbar Problem. ~ The Blog Doctor. You are here: Home > Wireframe > Fix the Page Elements Layout Editor No Scrollbar Problem. Fix the Page Elements Layout Editor No Scrollbar Problem. 2. Blogger Dashboard page opens for successful login. 3. Click 'Layout' link under your blog title. 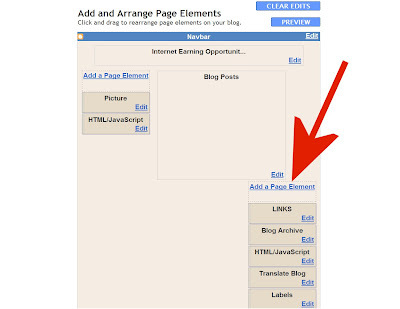 4 The Page Elements subtab of Layout tab will open. 5. Click 'Edit Html' subtab of Layout tab. 6. The Edit Html tab will open with the Template Code box. 9. Paste it in the Template Code box immediately above the ]]></b:skin> tag. 49 VIEWERS CLICKED HERE TO COMMENT ON THIS POST. ADD YOUR COMMENT. Thank you very much! This solved the problem which appeared when recently I tried to update my layout. The result is now probably not entirely what it should be, but at least the layout page problem is solved. Check out the comment by RJ3SP above. I have been dealing with that problem for a few weeks now.. and appreciate your help with it! Well, I don´t understand the need of this change (from blogger, I suppose ) and the result isn´t as good as before (the bar widgets appear above the middle bar ones). And what seems worse: with IE it keeps working fine! I can´t see any effect with the new vars included. But now I can at least access all my widgets. Thanks. this did not work for me. I am using the Denim template, I have the startSide and endSide variables, etc etc ... my template's width is 1110px. Could that be a problem? this concerns this blog: asitest.blogspot.com - it is a test site for some revisions I am working on for another blog which however cannot be "played with: as it gets a lot of traffic.. Fix worked for one time only and then I'm back to frozen frame. I deleted and re-entered the codes. It worked one time only. I checked the HTML and the code was in there. I am emailing this to you also. I've tried the above fixes and different variations of them. Nothing is working. I can see a maximum of 7 sidebar page elements on the page element page. When I first started using this template, I could see all of them. Only in the past two days have they been getting cutoff. Do you have any other ideas? The template I'm using wasn't provided by Blogger (although its pretty basic) and some things I cannot change certain things (fonts and colors, email links for posts, turn on/off quickedit, stuff like that) via the interfaces provided, so I've been forced to learn XML as I go here. How to Upload to Free hosting. and then provide the link to it here so we can analyze the problem. Like Darryl, some of my sidebar page elements were cut off two days ago. I cannot scroll down beyond a certain point and there should be another 4 or 5 page elements present. I am having the same problem with my blogs at laketrees and PoeARTica..
hello. i have a 2-column template and my problem is the layout/page element page won't scroll down. i cannot edit more than half of the page elements i put up. I am also having the same problem. The vetical scroll doesn't go beyond a certain point. Please, could you help us? i also cannot scroll down beyond a certain point. i cannot edit half of my page elements since the since the quick editing is alo not showing. help! Thanx a million very easily described got it very quick. very niceblog, i've used lot of the feature expained here on my reviews site. thanks for the great work! It works...but only until I leave the page. The codes will not hold. Then when I try to re-enter I get "Variable is used but not defined. Input: startSide....."
Ok so my page elements are being cut off at the sides, i tried to insert all the codes i saw in this forum, and neither has fixed the problem. I don't see the codes mentioned above in your template! I've tried the above fixes and different variations of them. Nothing is working. I can't see a all sidebar page elements on the page element page. When I first started using this template, I could see all of them. Only in the past two days have they been getting cutoff. This is a known bug and the Blogger Team is working on it. Till then try this : Click the Edit link on the last page element you can see. Popup window will open. Close it. Press Tab key on keyboard. The next Edit link will come into view. Press Tab key again to show next Page Element and so on repeat till the last Page element is seen. Thanks for trying to help solve this annoying problem, but it didn't work for me. My problem is the layout/page element: the page won't scroll down. I cannot edit more than half of the page elements I put up. The vetical scroll doesn't go beyond a certain point. I tried your fix above, but it didn't work for me. Is there a limit to how many elements we are allowed to add to the template? When I Edit Layout, I only see the top half of my total elements. The bottom half do not come into view. The scrollbar won't go any further down. The fix is for the width problem. The Blogger Team is working on the length problem. Till then try the Tab method. Hi Vin. Thanks again for the Tab trick. It works for me while blogger fixes the problem. I've noticed another problem when I try to delete widgets: I can create new widgets and modify existing ones, but when I want to remove one from FF, the delete button appears to do nothing and there isn't the normal confirmation window. From IE it works well. ¿Do you konw something about that? Just delete the widget code line in the Template Code box directly. Thanks, Vin. It's a good idea, but I don't need it because it's simpler to delete it from IE. But I'd like to know if it is a known bug of blogger with FF or a problem in my configuration. Does not occur in my FF2 and have not heard it anywhere else. LOVE your blog! I can see all my elements but the footer - "Add New Element" isn't showing? Any ideas. This problem seems to have recurred again! Try clearing the cache and use Firefox browser. If that does not help try manipulating the code directly in the Template Code box on the Edit Html tab. Tried clearing cache - even tried another computer! Which code shall I manipulate? Have done the bit you suggest at the top. Can you send me the template? The email addy is in middle column. hey, i tried to edit my html codes with others but i cant seem to do it coz it says 'Your template could not be parsed as it is not well-formed. Please make sure all XML elements are closed properly. What code were you trying to paste in the template? You may have deleted the </head> tag by mistake. hey Vin. i took a blogskin codes from blogskins.com and every html code i try, it says the same thing. my friends dont seem to have that problem. You have to Revert blog to Classic Templates before you try loading a Classic Template. Tried inserting the code. Didn't work. Tried Tab Method. Work fine, but not able to add page element. After saving changes did you clear the cache? 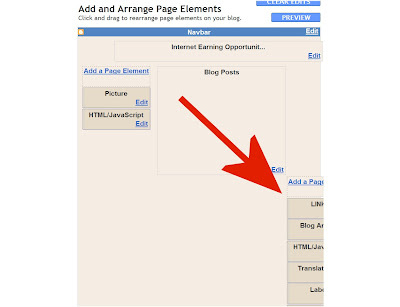 Which page element do you want to add - HTML, Text, Picture, LinkList,....? vin dear.. i tried most of the method to enable add page element in mine. the "add gadget link' is not there..
i've also deleted my old blog due to this in error. already send request to retrieve at help center. but all prove abortive. What do i do. Are you using Firefox browser on a PC? The Add Page Element link has been replaced by Add Gadget link. I made many changes to my template, which works fine, but i suddenly noticed that the POST-BLOG element dissappeared from my page layout, though i can all the posts perfectly in the blog. First Backup gadgets.Then click on 'Revert widget templates to default' link at the bottom of the Template code box on Layout--->Edit Html subtab.